TIMETABLES should be ‘fact, not fiction’, said a transport watchdog, after new rules measuring the punctuality of trains were announced by the Rail Delivery Group. From April actual train timings will be published to the minute at every calling point. The industry is already making internal use of this information in a bid to identify problems which delay trains. The Rail Delivery Group said the new system will be ‘the most transparent of all major railways in Europe’, and is ‘part of the industry’s wider programme of work to improve performance and increase customer satisfaction’. 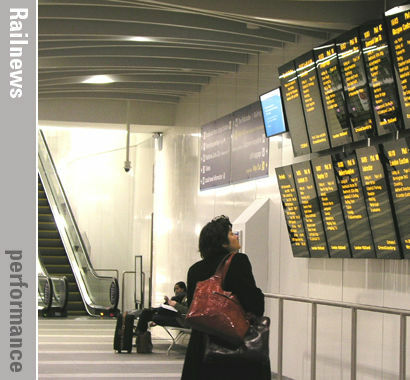 The current punctuality measure, known as the Public Performance Measure, considers a commuter or other local train to be ‘on time’ if it reaches its final destination within five minutes of the booked time, while the margin for long-distance services has been 10 minutes. This measure, PPM, has been criticised because it does not reflect late running during the journey, which can affect passengers travelling to intermediate stations. The industry is facing a challenge to improve its reputation after satisfaction declined in reaction to the timetable disruption last May, and operators will now publish a range of information about punctuality. The categories will be early, within a minute of the timetabled arrival or within three, five, 10 or 15 minutes and after 15, 20 or 30 minutes. The proportion of trains cancelled will also be shown. The tighter standards have been welcomed.